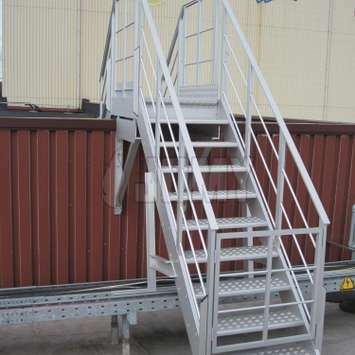 The use of JOMY ladders, stairs, stepladders, walkways, platforms and special constructions is highly advisable for all types of industries thanks to the high flexibility of our designs in marine grade aluminium. 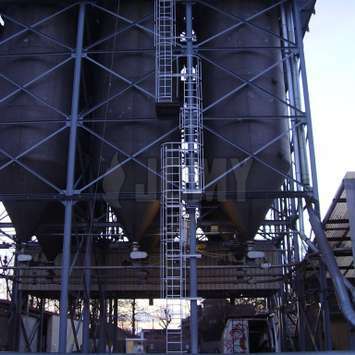 Our 50 years of engineering and worldwide experience is a garantee of the highest safety standards. 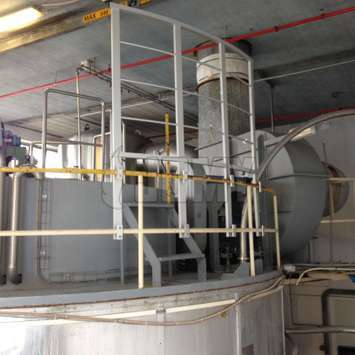 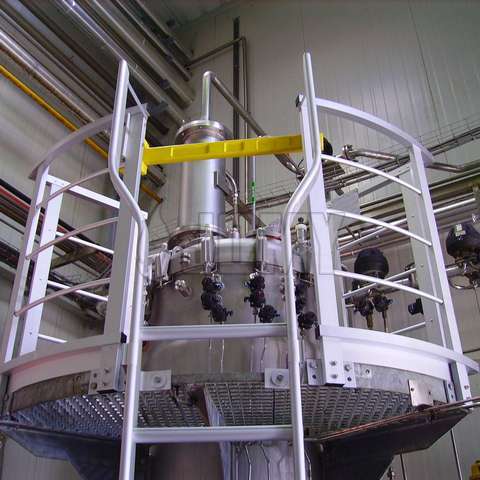 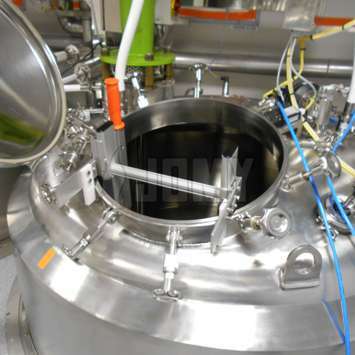 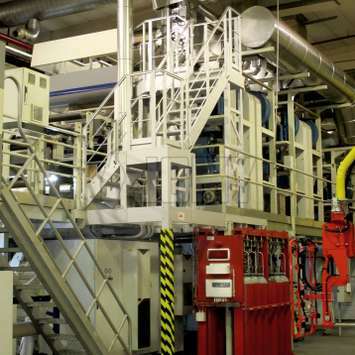 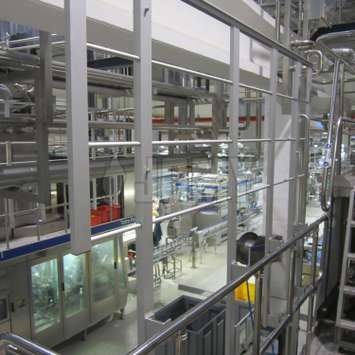 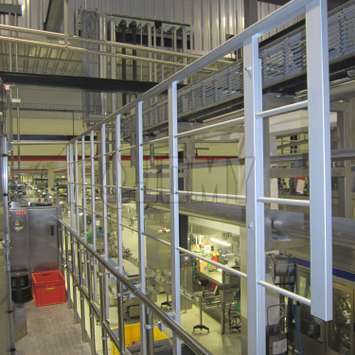 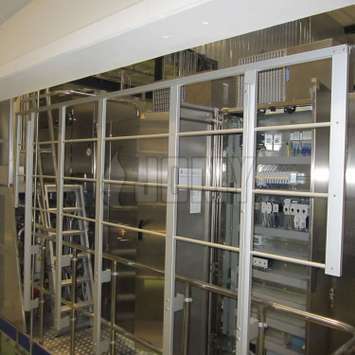 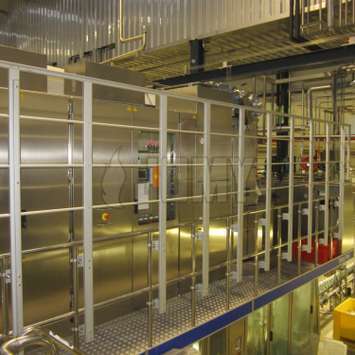 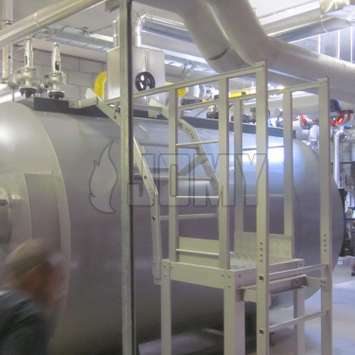 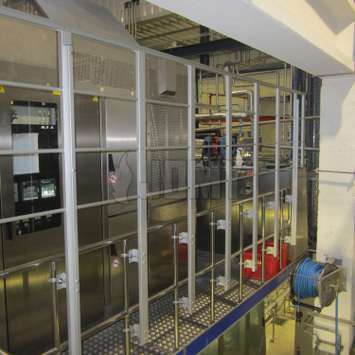 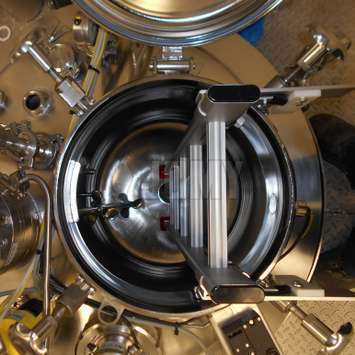 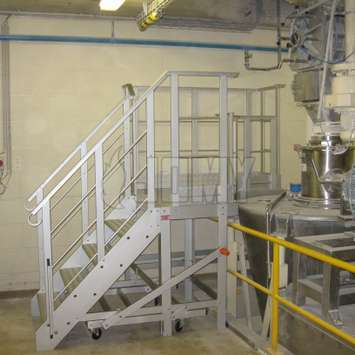 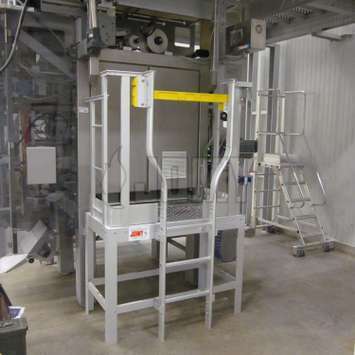 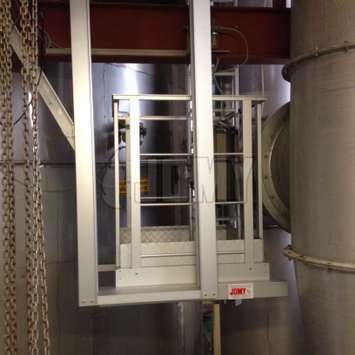 JOMY products are used in pharmaceutical environments for machinery maintenance and control and for safe access purposes. 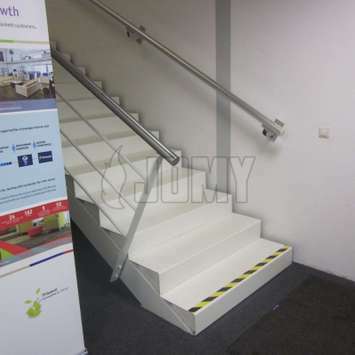 JOMY specialty ladders, stairs, stepladders, walkways, and special constructions are preferred in the pharmaceutical sector because of the high flexibility of our designs and our use of anodized Aluminum. 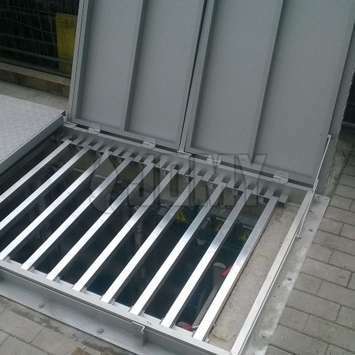 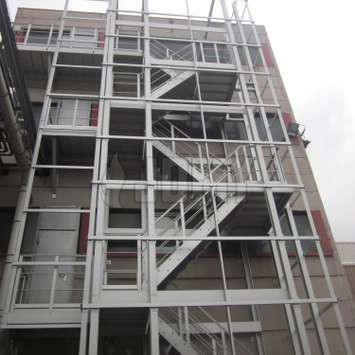 Anodized aluminum is accepted in this clean environment because it is resistant to corrosion even when cleaned regulary with chemical products. 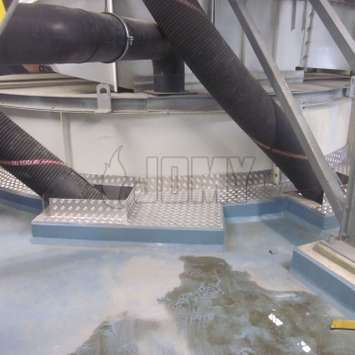 JOMY's engineers also understand cleaning methods and requirements in addition to rules regarding anti-contaminants. 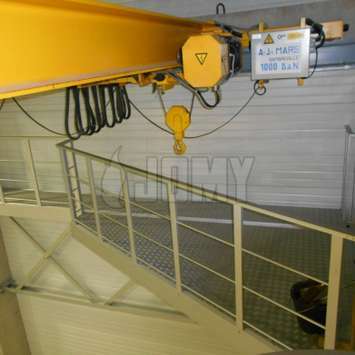 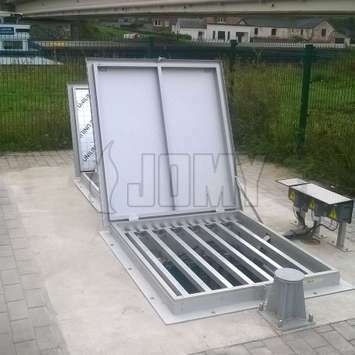 JOMY combines these requirements with the safety rules and habits of each company to create the best access systems. 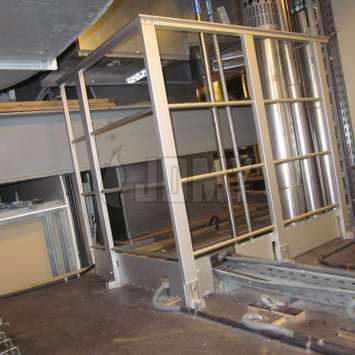 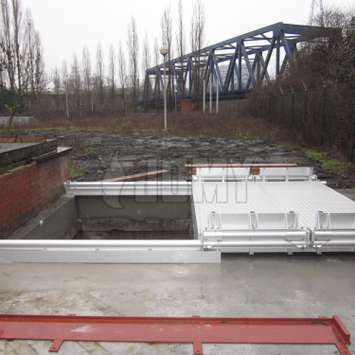 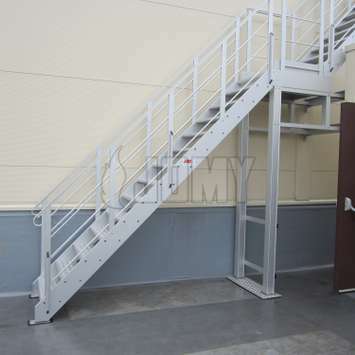 Our safety bars and gates, which all open only to one side, increase the safety of workers. 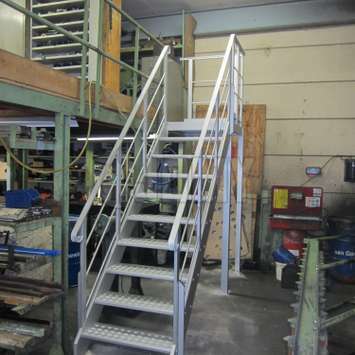 Our spacious platforms make it easy to move around in a safe and comfortable way. 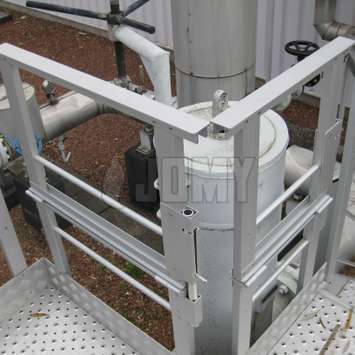 In the oil and gas industry, safety is of great importance, and JOMY steps in to help. 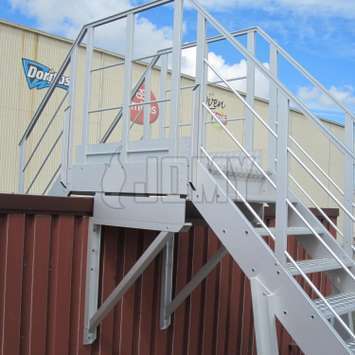 Exterior JOMY stairs and platforms are used for pipeline maintenance, and retractable guardrails are used on platforms. 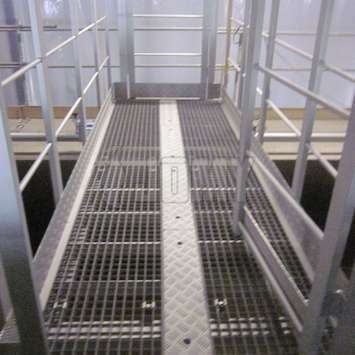 Retractable guardrails offer increased safety for workers on the platform while allowing for easy access to pipelines and machinery. 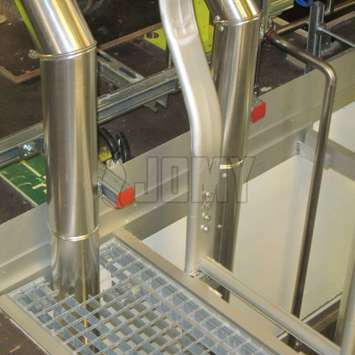 Horizontal and vertical lifelines are also used for pipeline inspection. 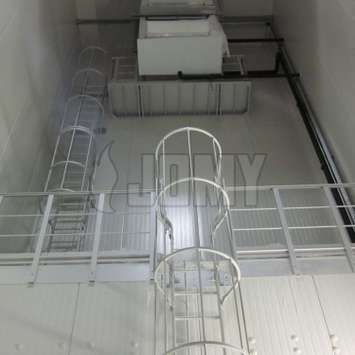 The requirements of the oil and gas industry are diverse, and JOMY's strength in adapting to customer needs makes us a leader in the industry. 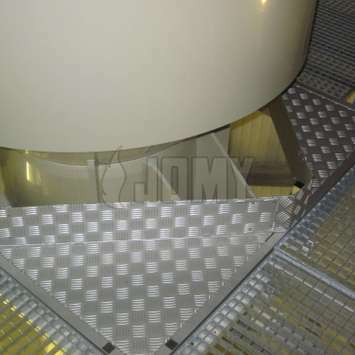 JOMY products are widely used in the manufacturing industry for safe and easy machine access or to get across production lines. 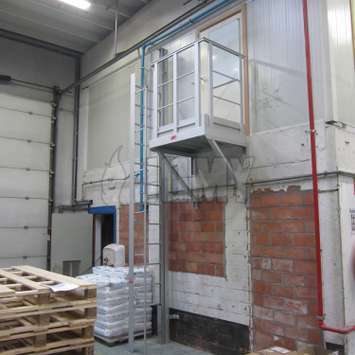 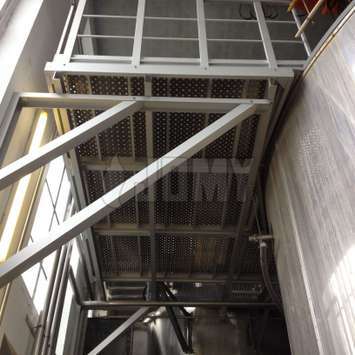 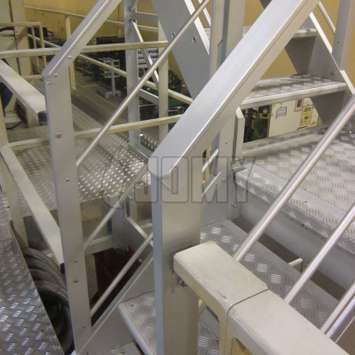 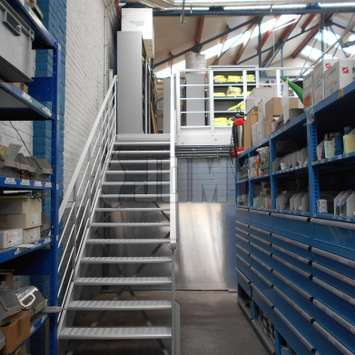 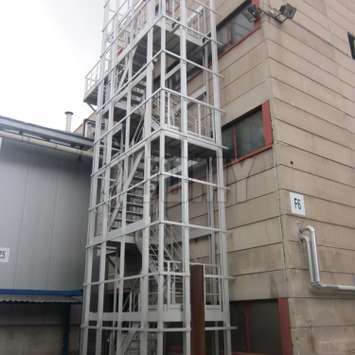 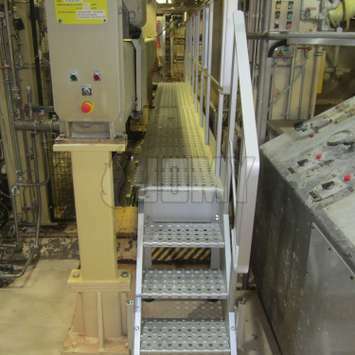 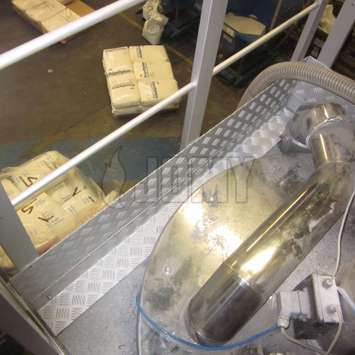 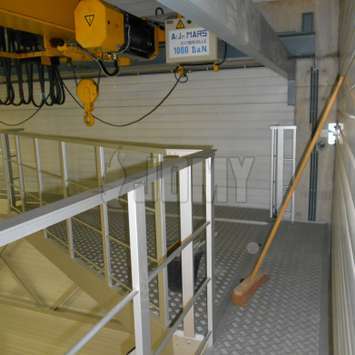 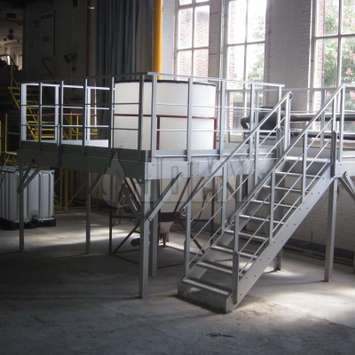 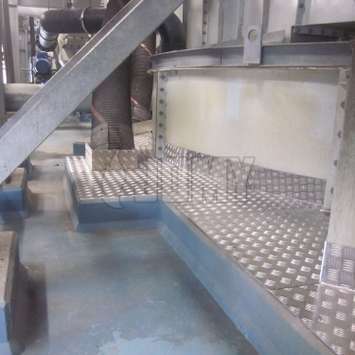 The JOMY stairs, platforms, and JOMY ladders (with or without safety cage) are commonly used in manufacturing companies for easy access to machinery for safe maintenance and control. 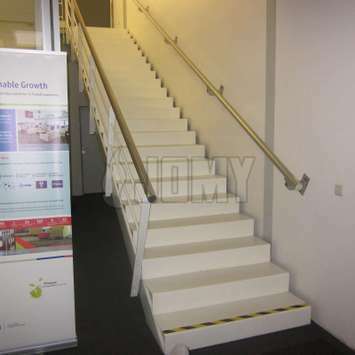 The stairs can be designed with all kinds of colors, layouts, and sizes to improve safety and awareness. 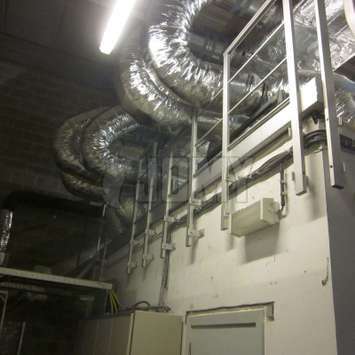 Recently we added also LED lighting as an option to our installations. 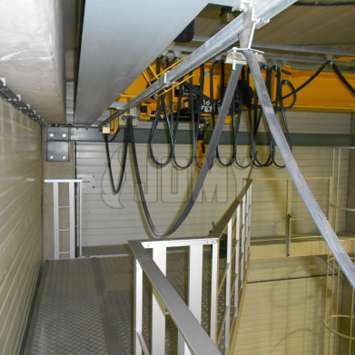 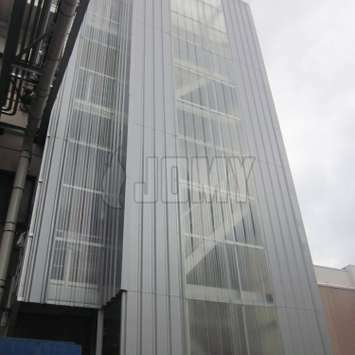 Custom JOMY constructions are adapted to the specific requirements of the industry. 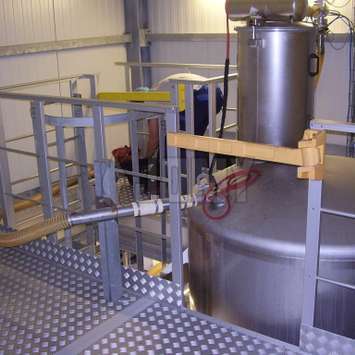 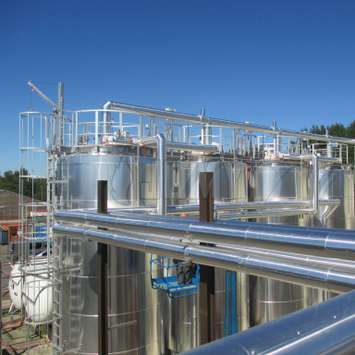 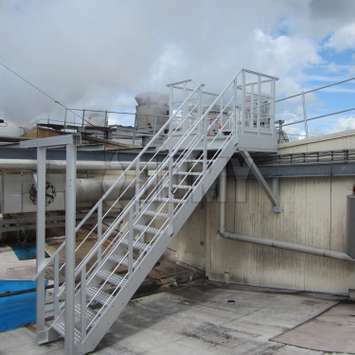 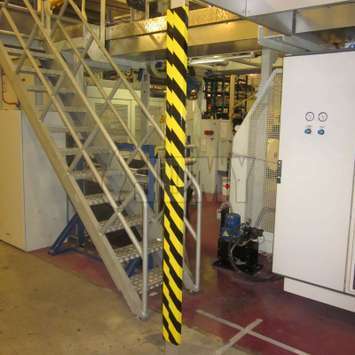 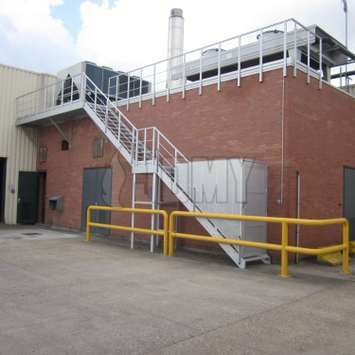 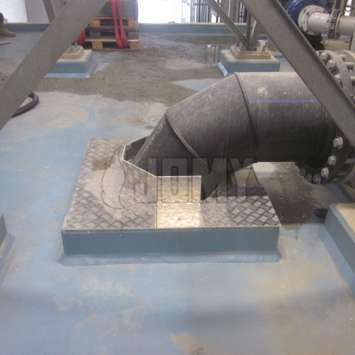 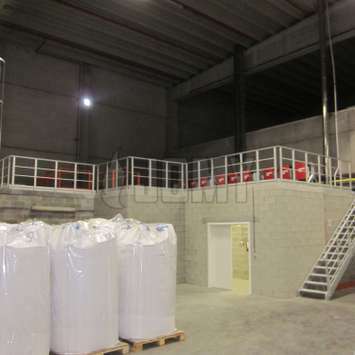 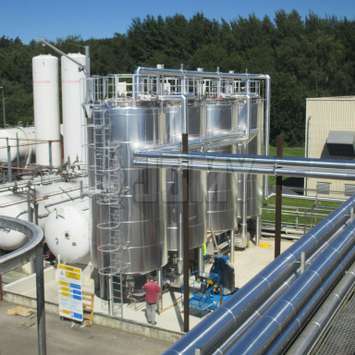 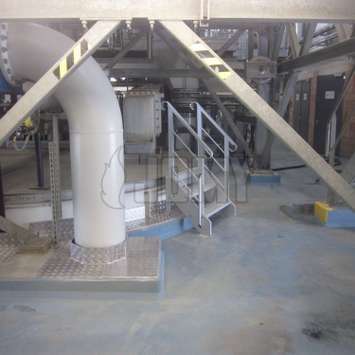 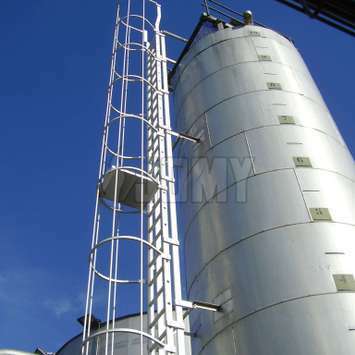 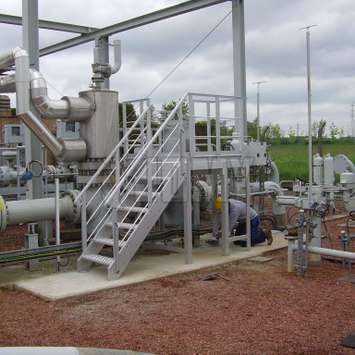 JOMY products in the chemical industry are used for safe maintenance, control access and fall-protection. 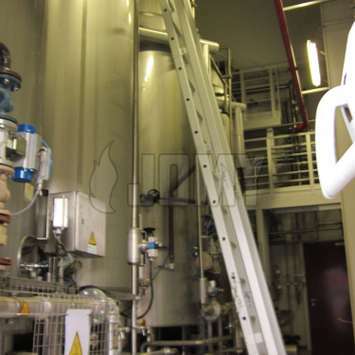 Because of the great heights of the piping and machinery in the chemical industry, extra protection for workers is very important. 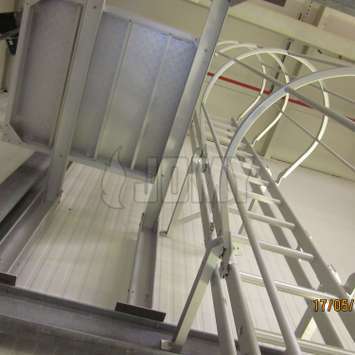 All JOMY ladders can be equipped with a cage, fall arrest system, and/or paneling for extra safety. 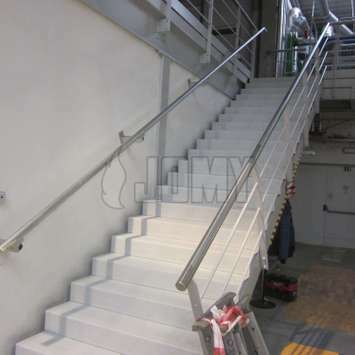 The most popular JOMY products in the chemical industry are the multi flight caged ladders, JOMY custom constructions, and retractable guardrails. 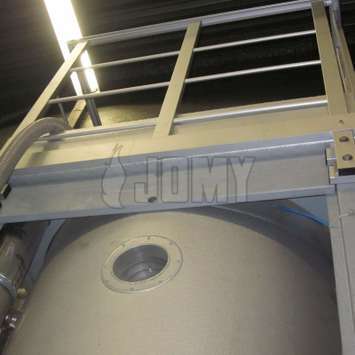 All of the JOMY products are made from high quality aluminium with a good chemical resistance. 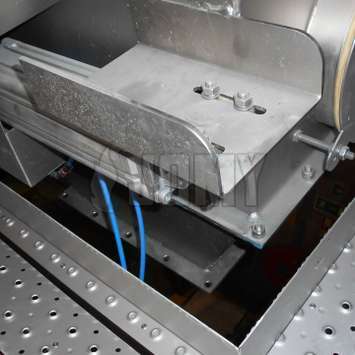 To improve this resistance we also offer anodized aluminium with an anodization layer of around 15 µm. 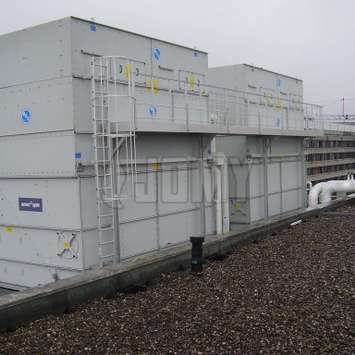 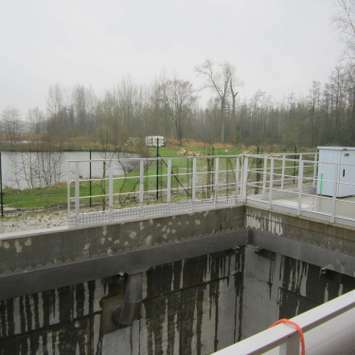 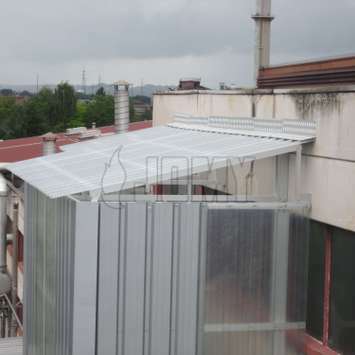 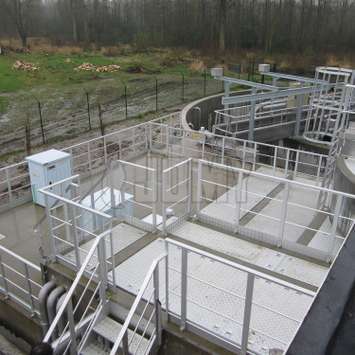 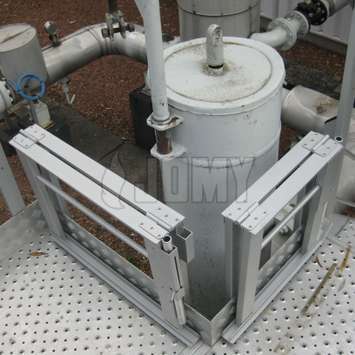 The energy industry uses JOMY products for safe access to high constructions. 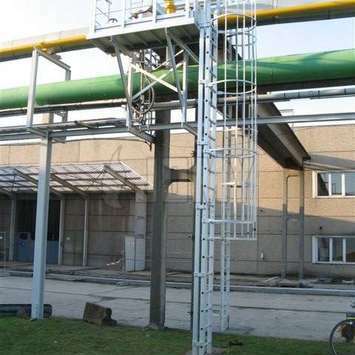 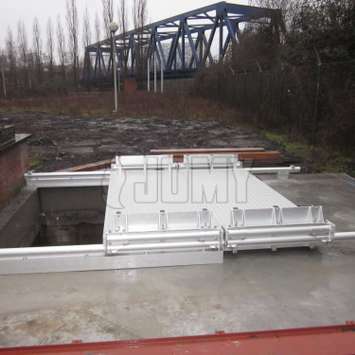 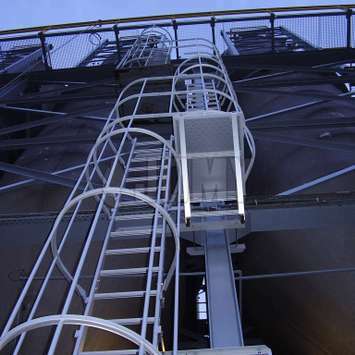 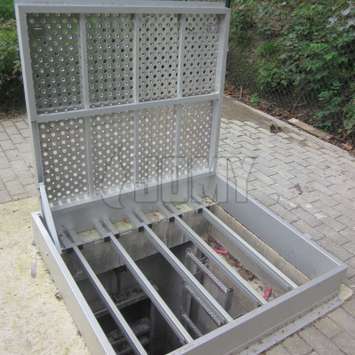 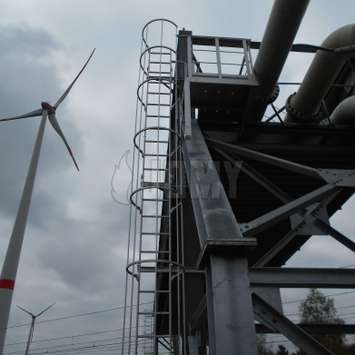 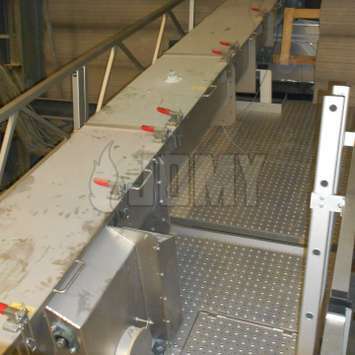 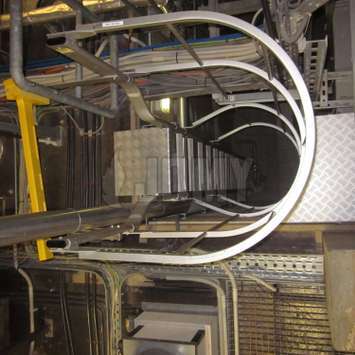 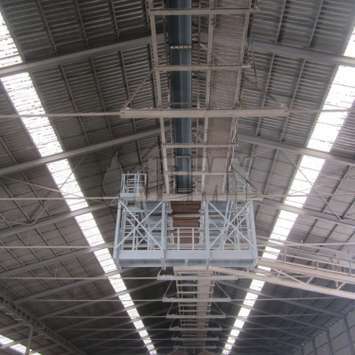 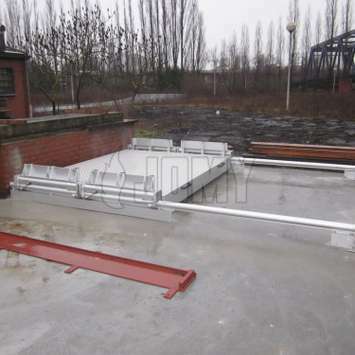 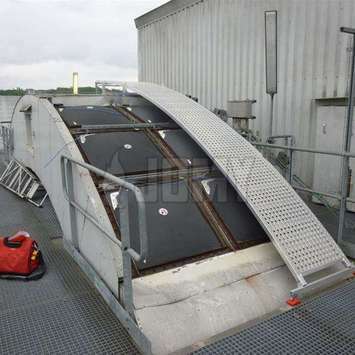 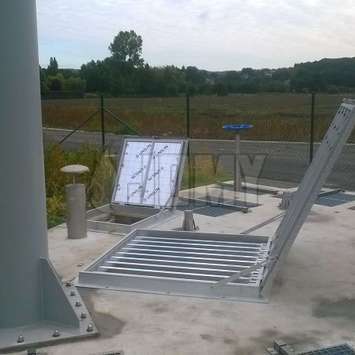 JOMY ladders and walkways are used in the energy industry to facilitate access and inspection. 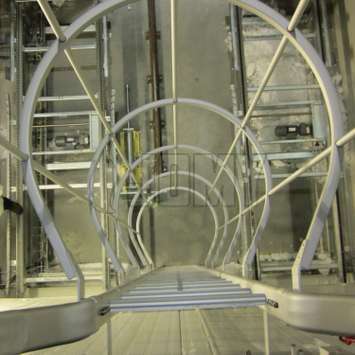 Ladders with safety cages increase the safety of access. 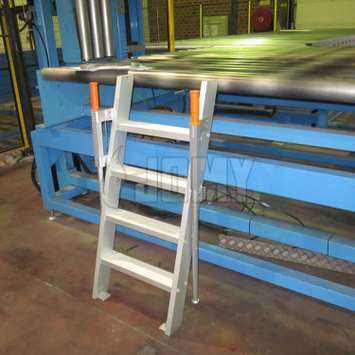 A JOMY counterbalanced ladder, deployed with a handle, is recommended to prevent unauthorized use and guarantee safety. 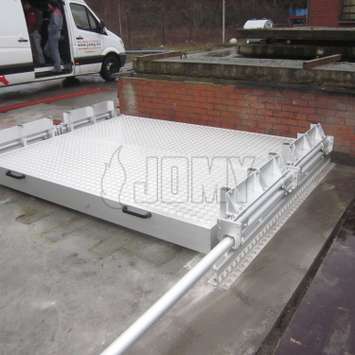 JOMY fixed walkways make it possible to reach installations and go from one to another in a safe and easy way. 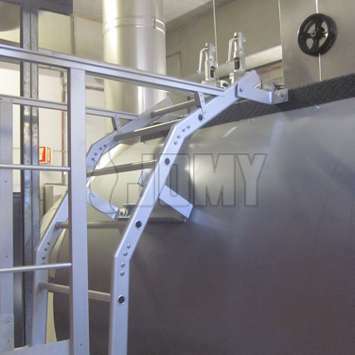 Aluminum JOMY products are the ideal solution for machine access and control in the food industry. 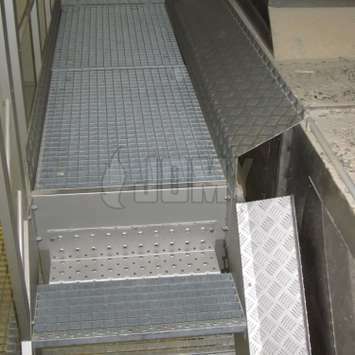 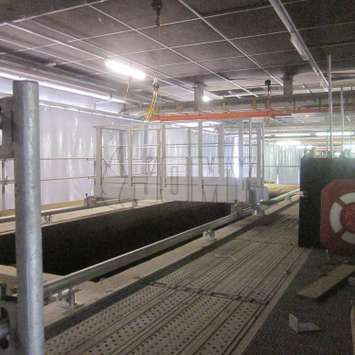 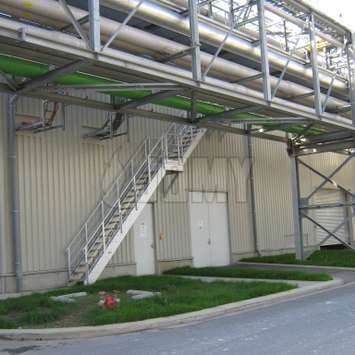 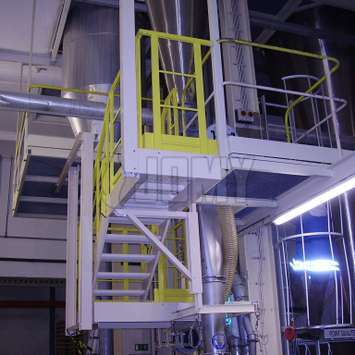 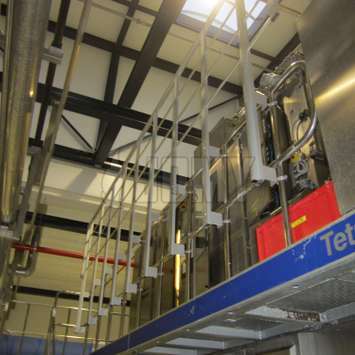 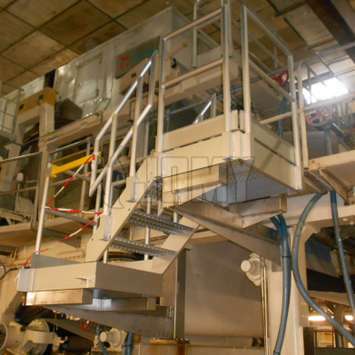 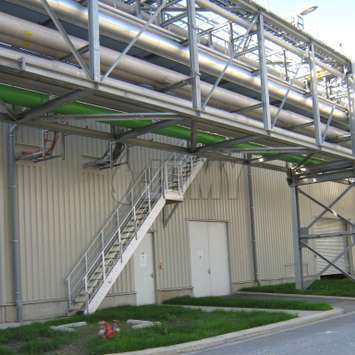 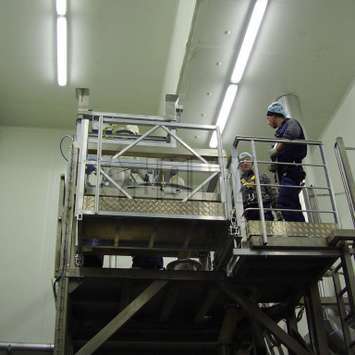 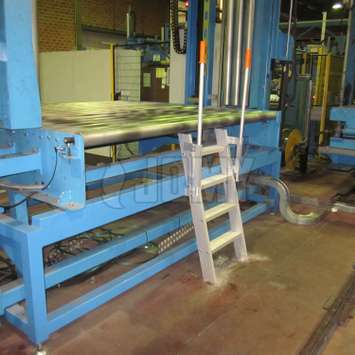 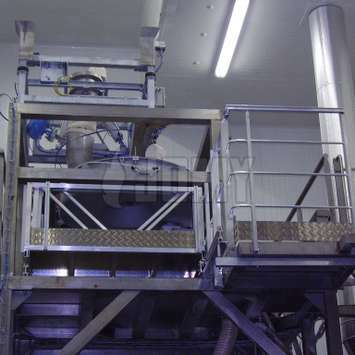 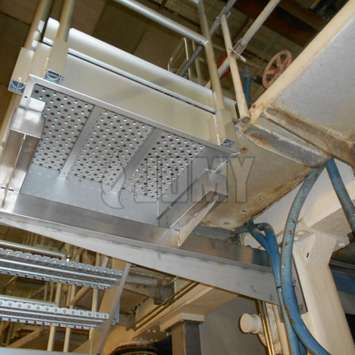 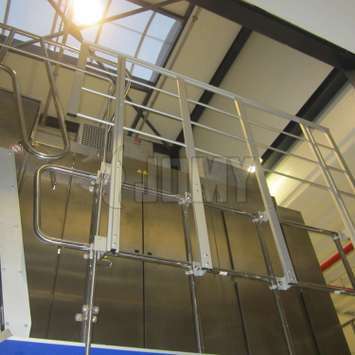 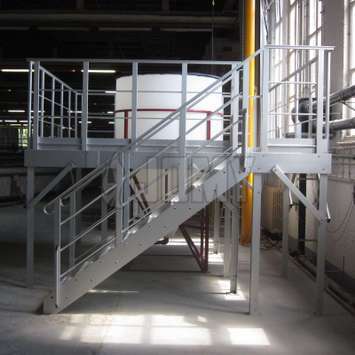 JOMY platforms are used in the food industry for temporary access and for crossing production lines. 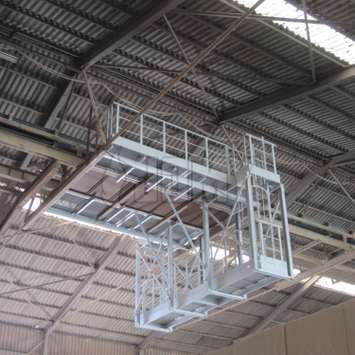 JOMY ladders with a cage preserve the safety of all workers who need to reach high machinery. 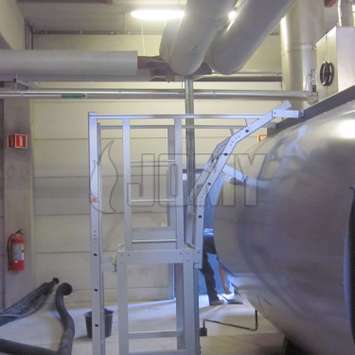 The hygene requirements in the food industry are very strict, so JOMY's clean and easy to maintain industrial aluminum is the best material for this industry. 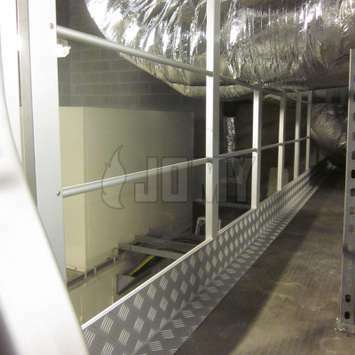 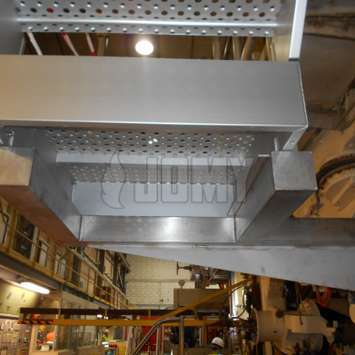 Another big advantage of the JOMY ways of working is the installation of JOMY constructions without welding so there is no risk on dust explosions or contamination. 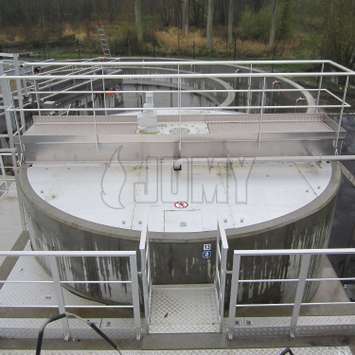 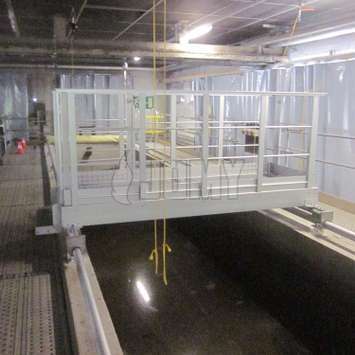 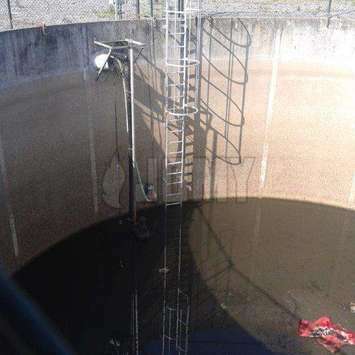 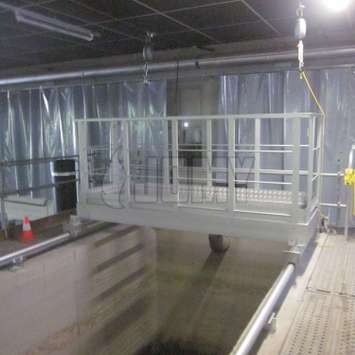 The presence of JOMY well ladders is essential in the water treatment industry. 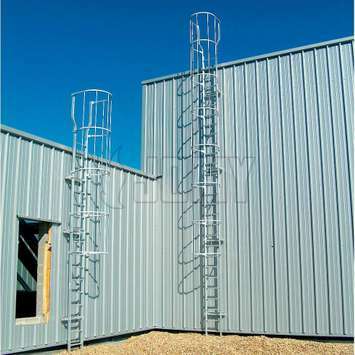 This kind of ladder can be installed to a curved or flat well surface. 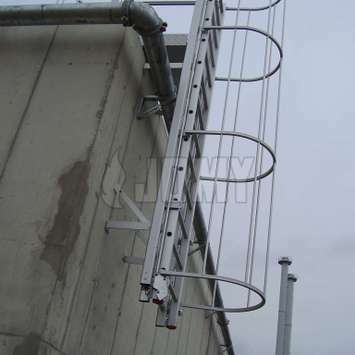 The JOMY wellladder can be suspended or can rest on the floor. 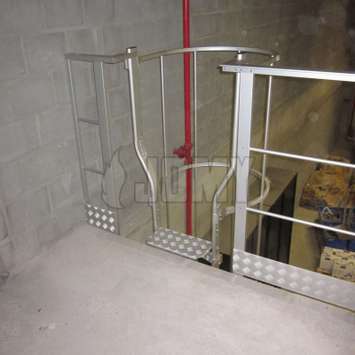 A telescopic handrail, safety cage or safety rail can be added for additional safety. 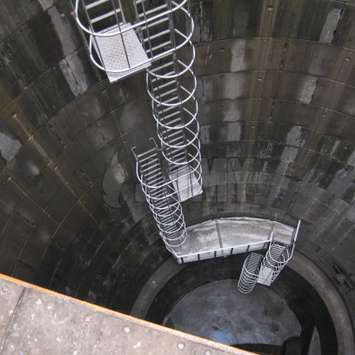 The wells are often deeper than 30 ft, so a JOMY multi-flight composition is recommended. 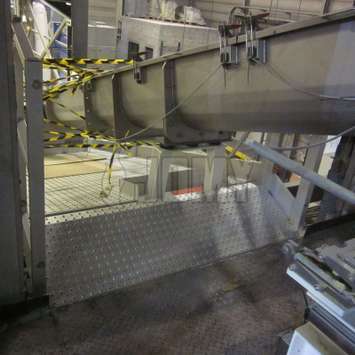 Workers can switch from one flight to the next via rest-landings. 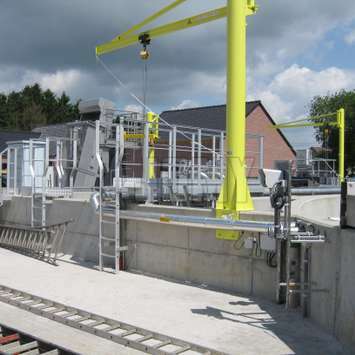 The water treatment industry is where we sell the most lifelines. 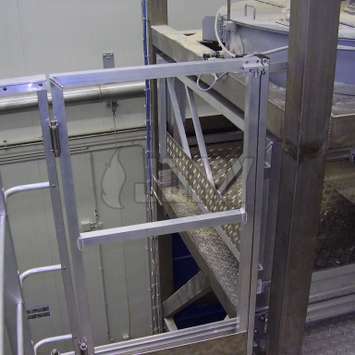 Horizontal and vertical lifelines are used to safely descend into wells for inspection. 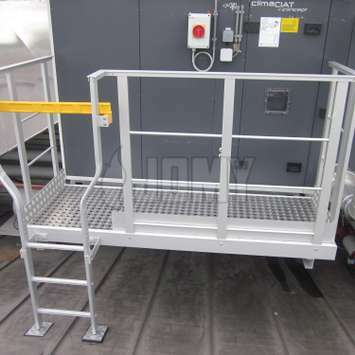 JOMY Lightweight aluminum stairs and JOMY permanent ladders with platforms are used to access machinery. 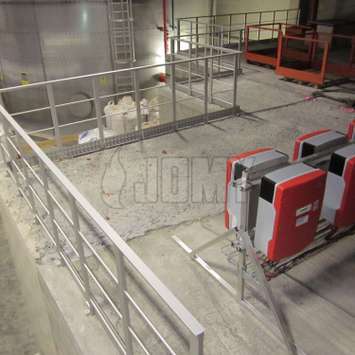 JOMY products facilitate the sorting of materials in the waste management industry by giving safe access to the big trash containers. 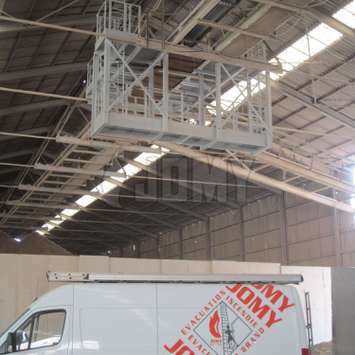 JOMY Mobile access platforms are used for temporary or permanent access in the container depot. 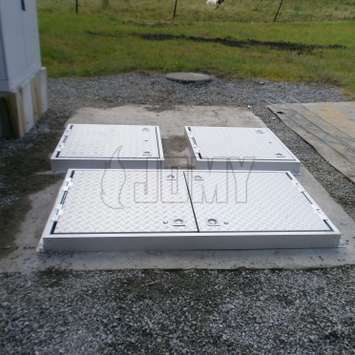 This platform allows safe access to high containers. 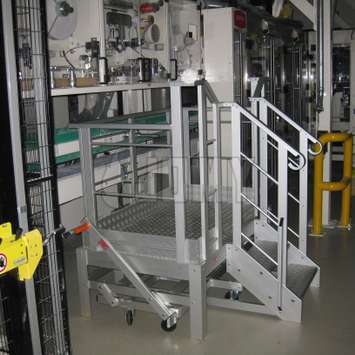 Small wheels underneath the platform offer the ability to easily move from one container to another. 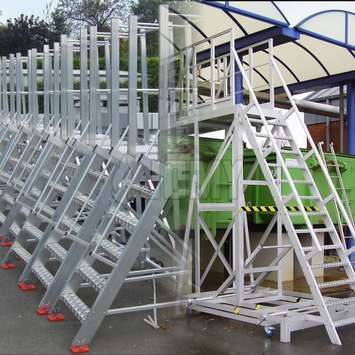 These JOMY mobile stepladders are used in all kind of weather conditions in all kinds of environments so the industrial aluminum that JOMY uses is a recommended solution for reliability. 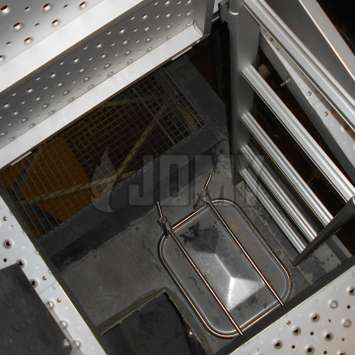 The mining industry uses JOMY products for safe machine access. 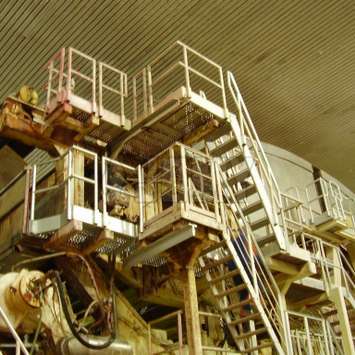 The enormous excavators in the mining industry are hard to get into and to reach for maintenance and cleaning. 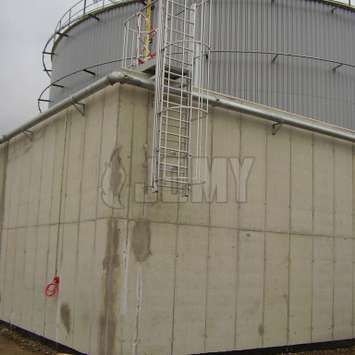 JOMY counterbalanced ladders make it possible to easily and safely access the excavator, instead of using the tires as a step. 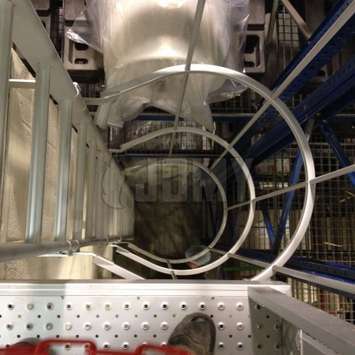 For even more safety, a JOMY safety cage and/or fallprotection can be added.